Then (1925) and Then (1932) – Super- Hooper-Dyne Lizzies (l) and Taxi for Two (r), both directed by Del Lord. 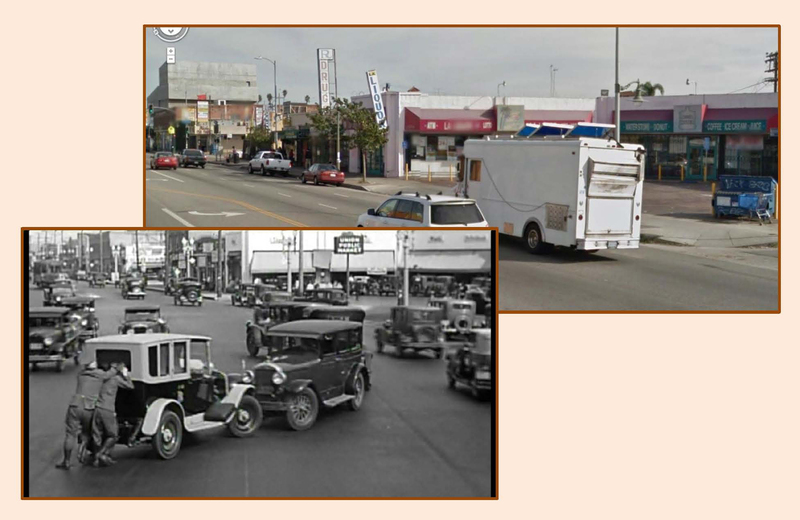 The 1932 Hal Roach Studio comedy Taxi for Two provides a fascinating glimpse of early Washington Blvd., and the mid-city neighborhood that sprung up south of Hollywood halfway between Culver City and downtown Los Angeles. 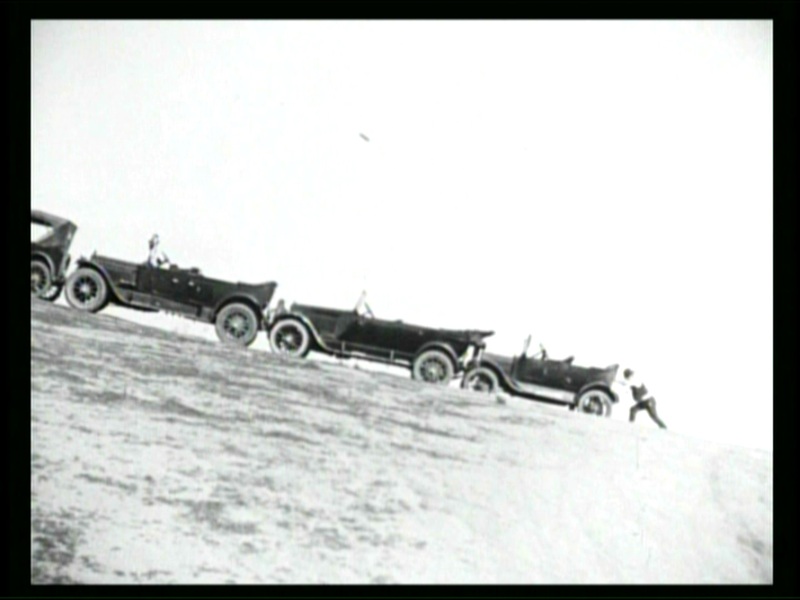 Directed by Del Lord, one of Mack Sennett’s top directors, Taxi for Two re-stages some of the classic visual gags and car stunts Lord had made famous working for the Keystone Studio in the 1920s. The highlight of the film comes when the Taxi Boys (Billy Gilbert and Ben Blue) run out of gas, and start pushing the rear of their taxicab blindly forward. The men are so intently focused on their task that they don’t notice when they push their cab into the rear of another vehicle, and continue forward pushing both cars. The boys soon push the two cars into a third vehicle, adding it to the chain, and then a fourth car, until finally a stalled trolley car joins the mix. The image of Billy and Ben pushing an undulating train of autos and trolleys down a city street recalls the Sisyphean image of Billy Bevan pushing a similar train of cars (above, right) in the Del Lord-directed Keystone comedy Super-Hooper-Dyne Lizzies (1925) (available as part of The Mack Sennett Collection, Vol. One from Flicker Alley). Click to enlarge each image. Looking east down Washington Blvd. toward the corner of West View Street. I found the many locations from Taxi for Two by first noticing a sign for the Beacon Market appearing in the background, above. 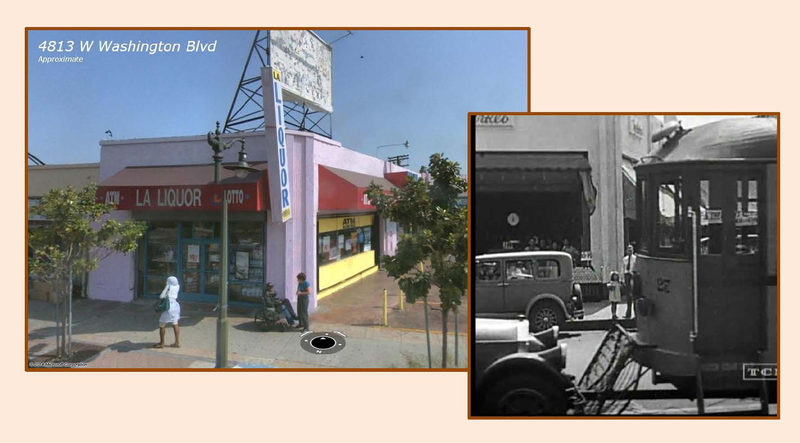 Although I couldn’t find such a market in the online City Directories at the Los Angeles Public Library, I did find a newspaper story in the library’s online Los Angeles Times newspaper archive that placed the market at the corner of W. Washington Blvd. and S. Rimpau Blvd. Looking east towards 4748 W. Washington Blvd. from Rimpau. 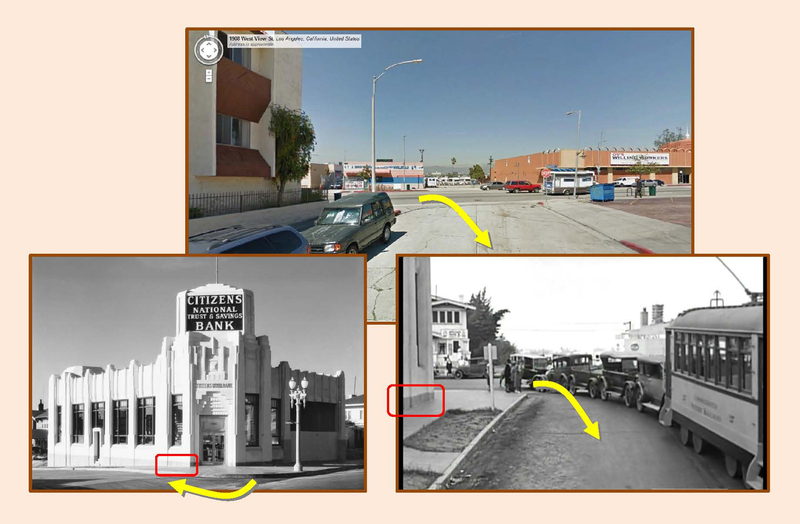 Once I had my bearings, I poked around the area using Google Street View and found the other filming spots along Washington Blvd. 4818 W. Washington Blvd. just east of West View Street. Looking east towards the Union Public Market at the SE corner of W. Washington Blvd. and West View Street. The caravan turns right from Washington Blvd. on to West View Street, beside The Citizens National Trust and Savings Bank (now the site of a nursing home), a small architectural gem that once stood on the SW corner. USC Digital Library. I found the remaining locations, again, by snooping around adjacent streets on Google Street View. My big break came when I noticed that West View Street (pictured above looking north) seemed to drop off below grade, as if Washington Blvd. ran along a hill. So I searched the steep hills situated north of Washington Blvd. until I found the remaining shots. 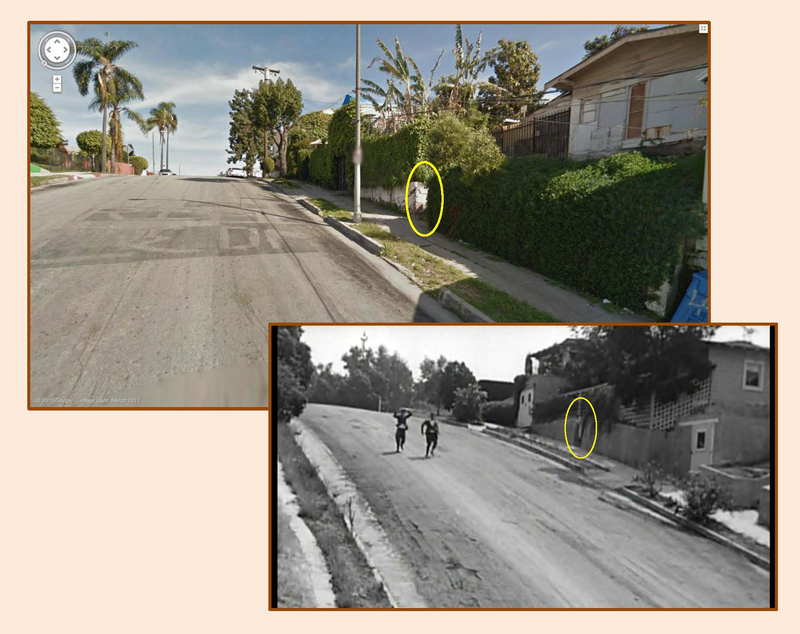 Ben and Billy run down steep Pickford Street towards Rimpau, steps away from Washington Blvd. The oval marks the back entrance way to 4175 Mascot Street appearing in both images. 4710 Pickford Street (a temporary structure has been added above the garage). 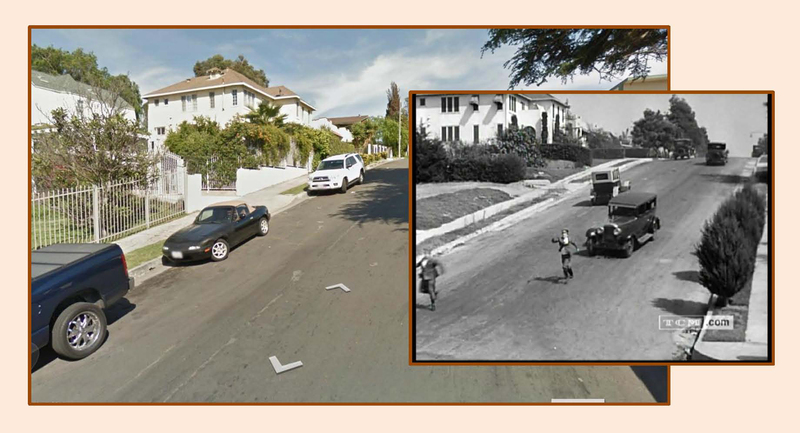 The first car stunts, where Billy and Ben chase the cars, were filmed on Pickford Street, a very steep hill just steps from Washington Blvd. 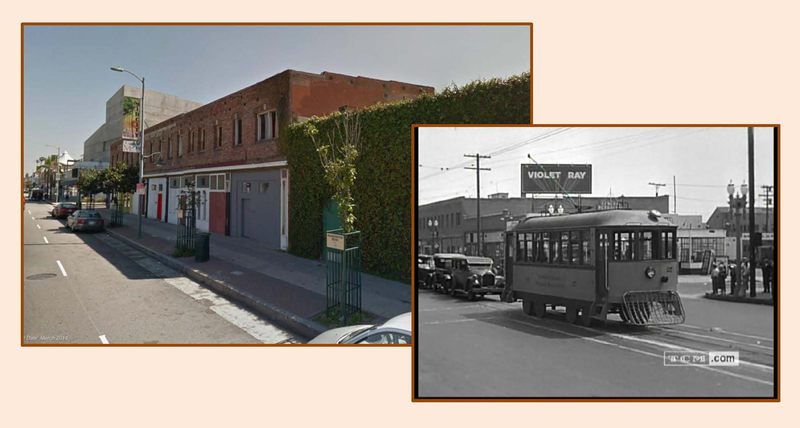 where the earlier commercial street scenes were filmed. 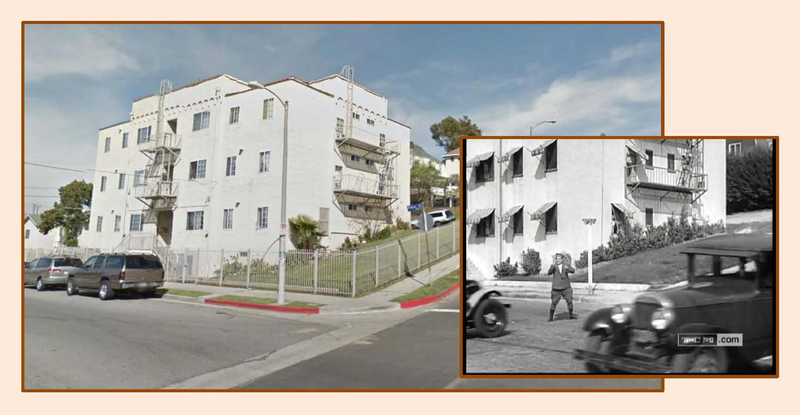 The later car stunts, where Billy and Ben dodge the cars, were filmed a few blocks further north on W. 17th St. at S. Rimpau Blvd., where the hill was less steep, and presumably safer for the actors. 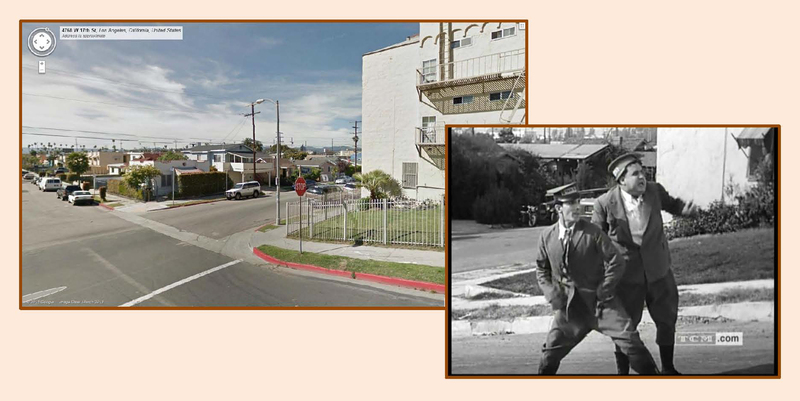 The director helped to disguise the shift in streets by showing only the south side of Pickford and the north side of 17th. 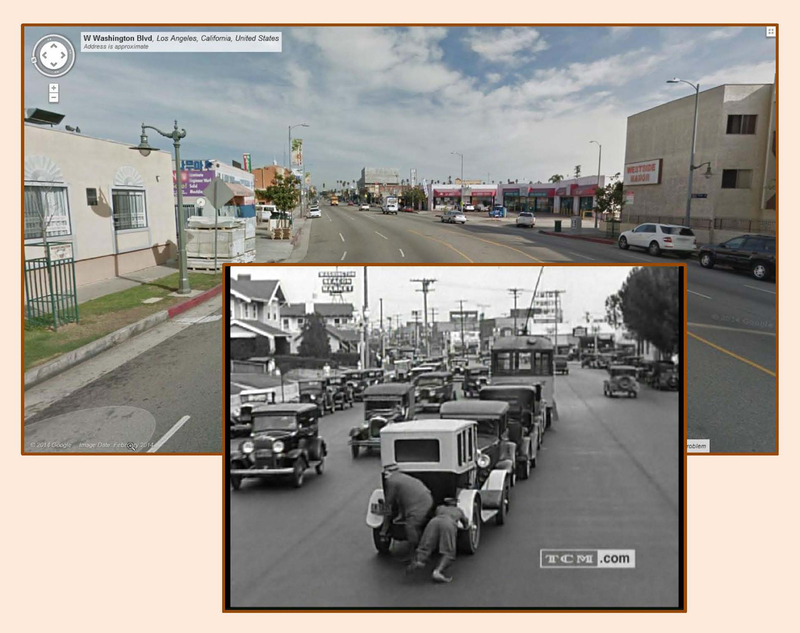 The concluding scenes were filmed at 17th and Rimpau as well. The remaining stunts were performed on nearby W. 17th St., which was less steep. The duplex at 4723-4725 appears to the upper left. Ben and Billy prepare to dodge the speeding cars. Behind them is the corner of S. Rimpau and W. 17th St. Looking towards the NE corner of S. Rimpau (l) and W. 17th St. (r). The taxi comes to rest between 4813 and 4807 W. 17th St.
4813 W. 17th St. appears behind Ben in this reaction shot. 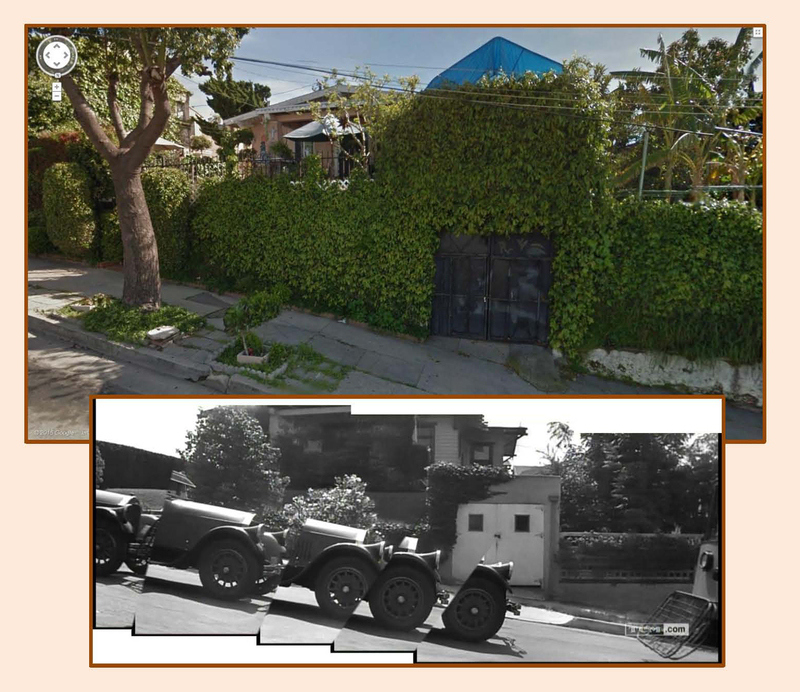 The detached garage to 4807 W. 17th St.
You can read about how three other Taxi Boys shorts solved a Laurel & Hardy filming location mystery at this post HERE. 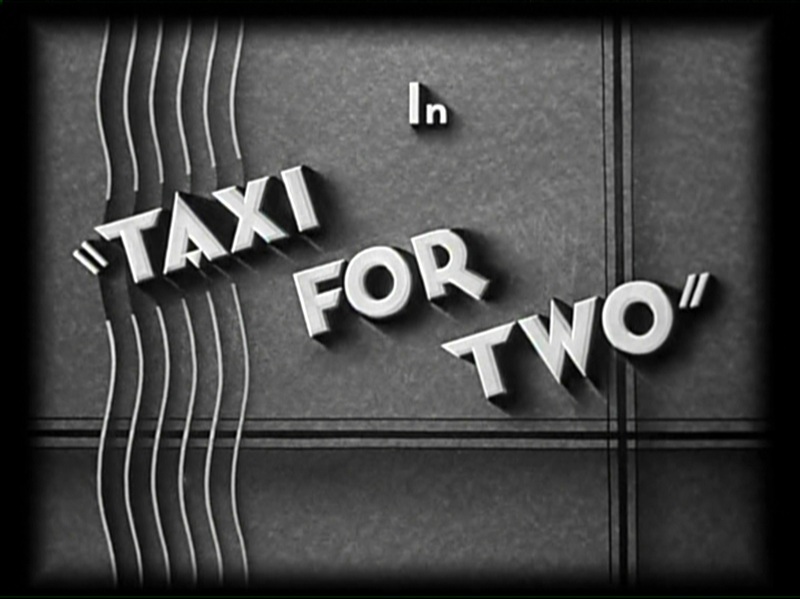 Taxi for Two (C) 1932 Hal Roach Studios, Inc. Color image 4818 W. Washington Blvd. (C) 2014 Microsoft Corporation, all other color images (C) 2014 Google. This entry was posted in Hal Roach Studios and tagged Ben Blue, Billy Gilbert, Hal Roach, Hal Roach Studios, Taxi Boys, Taxi for Two, then and now, Washington Boulevard. Bookmark the permalink. John — I was looking at AIR TIGHT tonight and wonder where was Bowlus Glider School and Eden Auto Camp? The glider school was located in San Diego. Yes, they all went down to San Diego to film that short! Thanks. Without ever researching this, I always figured it was near LAX. That’s cool Peter. Thanks for sharing.